Carolyn Custis James wrote this book as her own addendum to the best selling secular book, Half the Sky, which is a book based on the Chinese proverb that women hold up half the sky. It is a cry for justice and action against the oppression of women and girls around the world. Without having read Half the Sky, I think I might agree with it actually. There is no objection from me if we want to encourage people to help end the degradation of women around the world. But Carolyn Custis James has gone too far when she extends that narrative to the church, and indicts the New Testament Church for contributing to female abuse because of our teaching on gender roles. I say the book is half the truth! There is just enough Christian-ese and caricatures of traditional churches to make a reader wonder if she’s right. She points out stories of the Bible, but fails to really exegete the passages. Half truths, though, are still lies. Although I am tempted to pick apart the hundreds of ideas with which I disagree, I will try to answer the main points of her book. Is the church partly to blame? Her premise is found halfway through the book, and Carolyn James is not the first to ask this. These are typical questions from the egalitarians and the Christian feminists, but they are the wrong questions. The question should be “what does the Bible really teach?” and “do we really trust God that He knows what He’s doing?” Her view of “God’s original vision for humanity” is not any sort of hierarchy, so she has begun her arguments with a huge assumption. She is saying that by not allowing women to have leadership over men in the church we are basically making the same mistakes as an abusive situation. Denying a woman her desire to be a pastor, in her view, is degrading. It is abuse waiting to happen. The idea that we should be free to pursue every burden we have, that our desires and so-called “vision” must have come from God is very simplistic. If a woman feels called to be a pastor, it is not God who is calling her! I don’t know how one can read Scripture and come away with any understanding other than “Our ways are NOT God’s ways.” What about David’s desire to build the temple (1 Chr. 28:2-5) or, Paul’s desire to go into Asia (Acts 16:6-7)? No, our desires and wishes are not preeminent. Only God’s desire for us is what matters. Just because a woman desires to be a pastor doesn’t mean her desire is right. She disdainfully looks down on any attempt at finding out what God really says in Scripture in favor of highlighting abuses which really can be found in any walk of life, not just in patriarchal societies. My view is that male headship is part of God’s “very good creation” and not a part of the fall. Her argument sounds familiar to me: “Did God really say that? And it is the oldest deception of all time! Abuses and degradation of women is an abandoning of gender roles. Men have abandoned their roles as Godly leaders in these abusive situations. 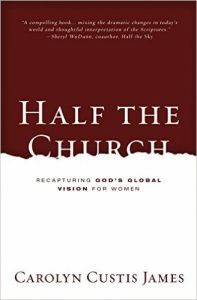 My answer to her main question is that by fulfilling gender roles of complementarianism, (which I believe is the Biblical teaching) then we ARE mobilizing all of the church. Carolyn James is advocating half the church abandoning their posts rather than fulfilling their duty given by their Commander in Chief just because they feel like it! So when we see degradation and abuse of women, the problem is not the church. The problem is sin. Read Rebekah’s full review at her blog, MostlySensible.com.